Florida’s Turnpike Enterprise Authority had a release from the previous underground storage tanks at the Canoe Creek Service Plaza in St. Cloud, Florida. We were hired to complete the remediation of a very large gasoline impacted area at the site. We designed and implemented the solution for Florida’s Turnpike Enterprise. 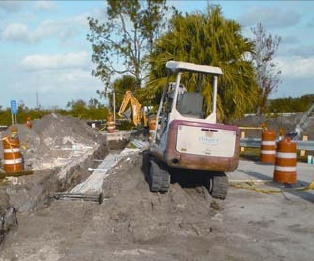 Construction plans, including recovery system layout, trenching details, well design and underground piping, were submitted to obtain FDOT right-of-way (R-O-W) and Osceola County Building Department permits to begin the construction. Utility clearance was also required for the facility prior to underground installation. We installed an extensive Air Sparge/Soil Vapor Extraction (AS/SVE) system at the service plaza. Utilizing its extensive design experience, we incorporated a number of advances to achieve a quiet, powerful system designed to be obscure within the service plaza, removing 400 lbs./day of petroleum hydrocarbons at start-up. The system consisted of 70 Vertical Air Sparge Wells and 57 Horizontal Vacuum Extraction Wells. 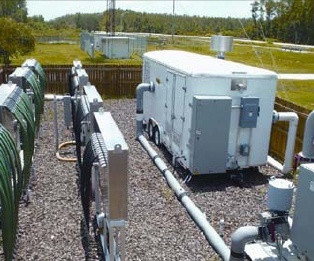 The equipment package consisted of a 40hp Air Compressor, a 40hp Multi-Stage Centrifugal Blower and a 1000-SCFM Electric Catalytic Oxidizer. 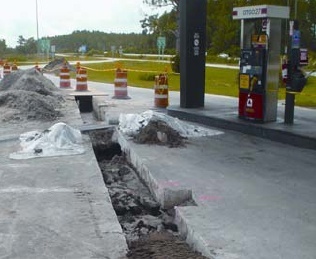 The project was completed under the strict guidelines of the FDOT, Maintenance of Traffic (MOT) protocols, as all of the underground piping was in the R-O-W for traffic entering and exiting the service plaza. The installation phase of the project was completed within a 6-month time frame. 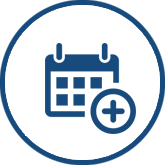 Our technicians provide Operation and Maintenance (O&M) at scheduled intervals to monitor performance of the system and cleanup progress.